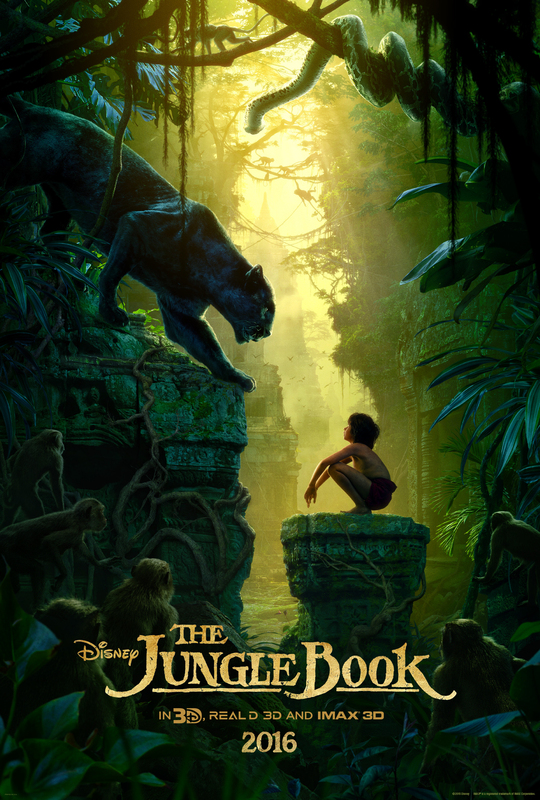 PLOT: The man-cub Mowgli flees the jungle after a threat from the tiger Shere Khan. Guided by Bagheera the panther and the bear Baloo, Mowgli embarks on a journey of self-discovery, though he also meets creatures who don’t have his best interests at heart. Rebooting a beloved classic is often a hiding to nothing and there are plenty of films that in their own right would be perfectly adequate, but when inevitable comparison to its inspiration is made then the fan-boys will be uber-critical (Total Recall springs to mind). Of course just as often they are just plain bad (Robocop!! ), but surely making a live-action version of arguably Disney’s greatest animated feature is an even tougher job? Apparently not. Director Jon Favrau has made much of the huge advances in film technology that have made his film possible, even to the point of admitting that the only ‘live action’ in the film is the performance from 11 year old newcomer Neel Sethi. Every tree, every animal, every river and every vista is computer generated. While this does make you marvel at how photo-real animation has now become, it also kind of kills the magic a little for me. For the most part however, the animation is flawless and you would not believe that you were anywhere but the Indian Jungle. There are a small number of exceptions, CGI stills has a problem with giving characters weight, so jumping often looks odd and some of the animals have been caricatured which juxtaposes the hyper-realism elsewhere. But pickiness aside and especially when watched in 3D, Jungle Book is a visual treat. 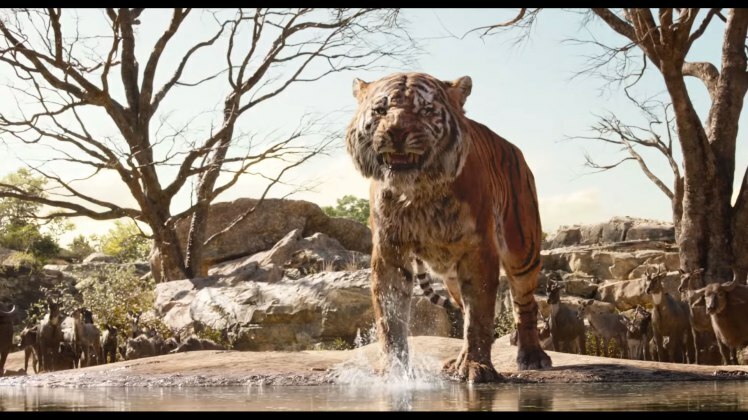 With a top quality cast of voice actors, Favreau’s Jungle Book ditches much of the music and opts for a more perilous tale of a man-cub raised by wolves until being forced out by the arrival of a vicious Bengal Tiger, voiced by Idris Elba. The casting of Elba was initially a bit of a surprise as his voice is cut straight from the London streets, whereas Disney’s Shere Kahn was a strictly upper-class delivery from George Sanders. However it doesn’t take long to see that the casting is spot on and that the tiger is no longer a sinister old statesman, but rather a from the streets gangster using his fists (claws) rather than his brain to get what he wants. Ben Kingsley plays the calm and collected black panther Bagheera. He is the straight laced patriarch to the young boy, providing wisdom and guidance and is completely at odds with the larger than life and lazier than everything sloth-bear Baloo. 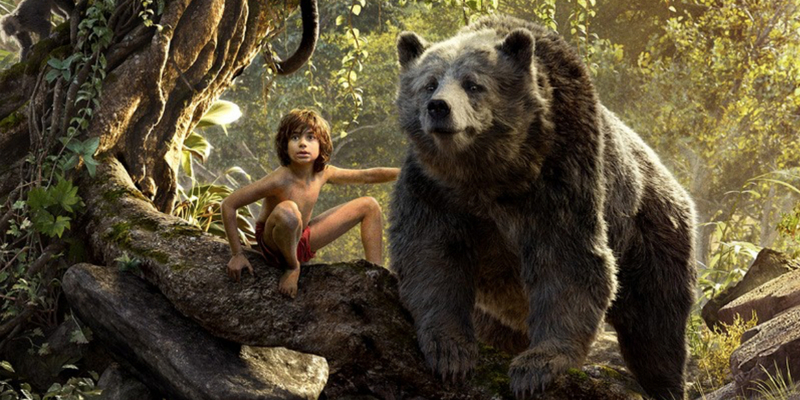 It is the meeting of Mowgli and Baloo that introduces the comedic element to the film and the first of two songs from the original Disney production that have been retained. The scenes of Mowgli and Baloo floating down the river to a chorus of The Bear Necessities is an absolute joy. The other song to make the cut is used to introduce the humongous ape, King Louie. Played wonderfully by Christopher Walken, Louie is no longer the globe-trotting Orang-utan from the animation (Orang-utans have never been indigenous to India). Instead and just as unlikely, he is a 100,000 years extinct Gigantopithecus. This change allows Louie a commanding presence as the mafia boss-like leader of all of the jungle’s monkeys and apes and his rage, coupled with Shere Khan’s claws, provide all of the menace in the film. Other big names appear such as Scarlett Johansson as the giant python Kaa, Giancarlo Esposita as the wolf leader Akela and Ikki the porcupine comically voiced by the late Gary Shandling. But of course it is Sethi as Mowgli that steals the show and his portrayal is probably the truest to the Disney original. With almost identical looks, movement and delivery you could interchange the 2016 live action and 1947 animated Mowgli and I don’t think it would affect the result in either film. That is testament of course to the young actor, but also to the quality of the direction and eye for detail that Favreau has. By celebrating but not remaking and taking inspiration from but not being hamstrung by what came before, Favreau has delivered more than many would have expected. Jungle Book is a delightful adventure, featuring a wonderful array of well-loved characters in a familiar setting, but telling a new tale and in a new and exciting way. Jon Favreau has already confirmed that barring a disaster at the box office, then a sequel will be made and on this evidence he should get to work post-haste! Having enough nods to its inspiration without losing its own identity, Favreau’s Jungle Book is delightful adventure and a lesson to Hollywood on how to treat treasured tales with the respect they deserve.